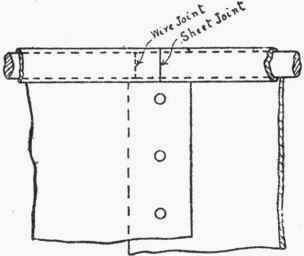 For plate work of a conical character, the centre line of the section should be taken as the slant height of the conical part required for developing the pattern. This is illustrated by line A B in Fig. 94. 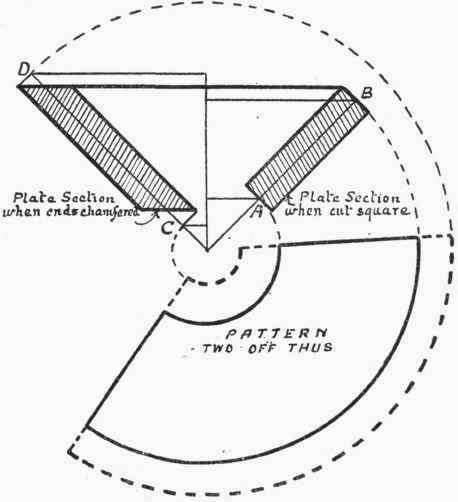 If the edges of the plates are to be chamfered, as shown by the section of plate on the right-hand half of figure, then the line C D will have to be used for the width of pattern; the plates being sheared along the two dotted curves. This is, however, a somewhat exceptional case, and has a very limited application. If the lengths of lines required for the pattern of plate are calculated, as in Fig. 89, then the whole of the calculations must have reference to the centre line of the plate section. This centre line really represents the section of an imaginary cone which passes through the centre of the plate. As explained in Chapter XXXII (Plater'S Work, Tanks, Shells, Etc. Allowance For Metal Thickness), the greatest care must be taken to properly allow for the thickness of metal.